Some of you might remember that I did a mountain biking leadership training course last year. In order to do the assessment you need a bit of kit. A big enough backpack to carry all of the kit was one of the items I had to buy. Dan, our instructor, had an Evoc bag and after seeing how practical it was I decided to investigate and buy one for myself. I was adamant that I was not going to buy the same size as Dan as it was just to big. There is also the danger of the more space you have the more stuff you will pack that you won't necessary need. These bags don't come cheap so I did quite a lot of research before buying one. I eventually found one on sale at Surfdome UK. This bag has been a great buy so far. The front compartment has a combination of mesh and material pockets where you can organise your necessary tools and spares as on photo below. 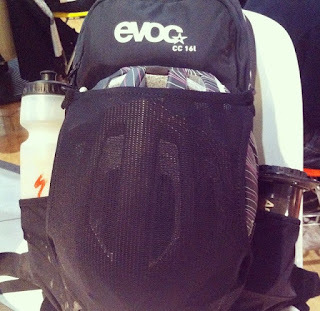 The front has a hidden pocket with a mesh helmet holder in store and also space for a rain cover. It also has two stretchy side pockets for either water bottles or in this case an aero press! At first I was worried about the length of the bag as I am quite short, but it works just fine for me. Because the bag is long and narrow the weight gets evenly distributed and doesn't pull you down. There is plenty of space on the inside for my other kit or 'luggage' and a compartment for your water reservoir if you were to do some bike packing like I recently did in July. The inside has a velcro strap to keep your water reservoir in place and also includes a zippered mesh pockets for valuables. The bag also features a thick band almost like a seatbelt around your waist. It sits on your love handles which isn't ideal, but I value it more as my safety belt when I ride than worrying about my love handles. :-) This band securely fastens the bag and helps it to stay in place and not move around. The band across your chest features a whistle and a clip to keep the mouth of your water reservoir in place. The shoulder straps are thick with breathable sponges. Honestly when you look at the bag you see things that you think might give cause issues, but when you use the bag, it just works! It doesn't feel heavy, it doesn't rub, it doesn't feel uncomfortable, it isn't warm, it is just RIGHT. The back of the backpack feels pretty solid and isn't floppy at all, it has back support and cushioning in the right places so that it sits nicely on your back. I was so chuffed when I first purchased this bag and gave everyone a tour of my awesome bag and all the goodies it contained! I would recommend this bag for people who lead big groups or do some bike packing. It offers everything you need and more. It is user friendly, practical and a great piece of equipment.